Did you know more than 25 million Americans suffer from some sort of flight anxiety? In fact, a flying phobia is the second biggest fear faced by Americans, as per the National Institute of Mental Health. Certainly it’s not easy to conquer this fear, but the flight experience can be a pleasant one if a kind flight attendant goes to great lengths to make the skies a little friendlier. This beautiful story of a Southwest flight attendant going the extra mile to calm a child who suffered a panic attack while flying went viral. On July 8, 2016, Erika Jeorgean Swart was flying on a Southwest flight with three of her children from Orlando, Florida, to Newark, New Jersey. As the plane was preparing for takeoff, Swart’s then-9-year-old daughter, Gabby, began having a panic attack. Swart was sitting with two other younger children, then aged 4 and 7, across the aisle from Gabby, and she couldn’t leave her row. Other than serious flying anxiety, Gabby also suffers from Type 1 diabetes. “I was very unprepared for the anxiety in general and then ultimately what it started to do to her blood sugar,” Swart told PEOPLE. Fortunately, an unexpected hero appeared to dispel Swart’s worries. He was none other than flight attendant Jovan Riley, also known as Garrick. Noticing Gabby was struggling, Garrick came to her rescue. He went all out to make the little girl laugh, brought her special drinks, and checked on her every now and then. When Gabby started having a complete panic attack as the plane was descending for landing, he came up to the front row and asked if she would like him to sit beside her in the empty seat, indeed so sweet. “He suggested they talk to distract her from thinking about the landing so they talked for around 30 minutes about everything from his daughter who is the same age to her pets to what grade she is going into,” Swart recounted on the Facebook page of Southwest Airlines. Ascertaining Gabby’s blood sugar had become dangerously low under extreme stress, Garrick quickly got up from his seat to bring her some orange juice. “She asked again if she could continue to hold his arm while the plane was landing. He of course agreed,” Swart wrote. Garrick remained by Gabby’s side until the plane safely landed. While the plane was taxiing to the gate, Garrick announced on the intercom that his friend Gabby had overcome her fear of flying and asked fellow passengers to give her a round of applause. The post eventually went viral, garnering over 42,000 reactions. Like Swart, many social media users were touched by Garrick’s kindness for going above and beyond. “This brings happy tears to my eyes!!! !” one wrote. “What a great employee to have..This was done from the kindness of his heart,” wrote a third. Without a doubt, Swart was glad to see the post went viral. Through the story, she hopes others will be inspired to do similar acts of kindness. “It didn’t feel like anything out of the ordinary for me. 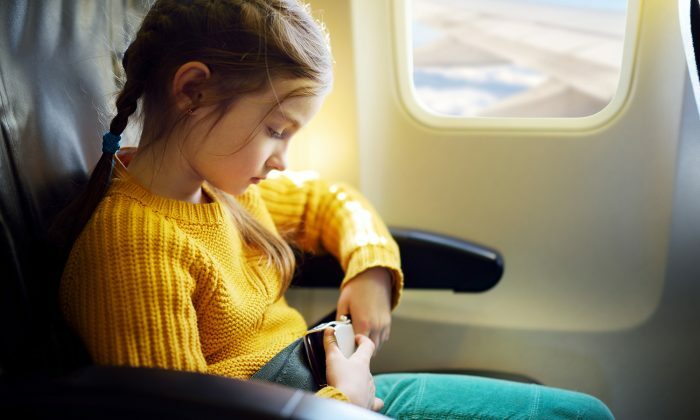 I just saw a little girl gripped with fear of flying and due to the stress of it her sugar level began to drop as well,” he shared through his wife on Facebook. What Garrick did may seem small, but the ripple effects of it were extraordinary. All thanks to him, Gabby had a terrific flight experience that she will continue to remember for the times to come. Hats off, Garrick, for serving this young traveler from the bottom of your heart.